The Gassy Gnoll: Social Maps for Adventures? The Gassy Gnoll leads an odd life at times. Recently he was looking at his Gnollbook profile and Gnitter feeds and was struck by the idea of using social media techniques to track relationships in RPG adventures and campaigns. Considering that he knows very little about social media trendspotting, it’s a wonder he came up with the thought in the first place, but the idea of having a different way to drill into a particular story context to figure out how to tie the PCs better into the world is something to explore. To test this approach, I decided I’d hop over to the list of Free D&D Adventures from Yax @ Dungeon Mastering and I found Keep on the Shadowfell, a level 1 adventure for D&D 4e from the 4th edition design team at WotC. This is a short (71 page) adventure and should serve as a good testing ground. It’s an adventure I know nothing about and might look at running in the future. So I started looking at it from a different angle. Maybe if I have details about the PCs – race, class, and a personal detail or two – I can come up with some links to key NPCs or areas through family or friends. Family – Raised in a good elven village home. Father killed protecting the village. Raised by mother. And a mysterious grandfather just appeared recently. Friends – A sorcerer with control issues. A nature lover. And a pet dog. Immediately I have a lot to work with. A family history. Some friends to imperil. And a routine to disrupt. Leaving names out of it, I can see where our scholar Cranewing might be a regular source of details about history and potential uses for components. He could ask the wizard to go exploring, and her friend with control issues can come along as a level 1 minion to encourage her. What are the pluses and minuses for? Those indicate a positive or negative relationship status. If it’s favorable, it’s positive. If it’s not, it’s negative. So what may still be a good idea starts to take shape, but needs to develop further into a useful tool. I can even see using this approach as a player to track NPC relationships and not just the GM… There’s more work and experimenting to be done. The Gassy Gnoll Wants to Know: What do you think? Do you guys use mind maps or social graphs in your games? If so, where and how? 3 comments to The Gassy Gnoll: Social Maps for Adventures? I stumbled across this article while looking for a Goblin village map to use in a game, and Google images displayed the mindmap image. @Photostyle – That’s awesome. 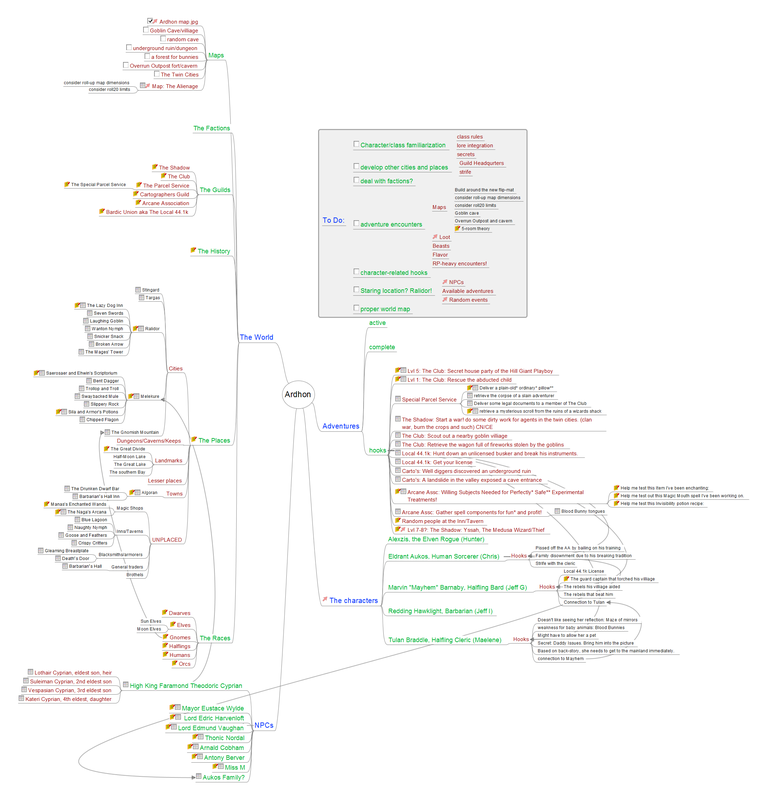 I’m obviously a huge fan of mindmaps myself, so adding another potential tool to the list is terrific. Thanks for sharing your map!